So you may be thinking to yourself, “What the heck is Pang?” Well if you lived in the US in the 80’s, you may know the Pang series better as Buster Bros. It was originally an arcade game where you play as two boys who use harpoons to pop bubbles bouncing around. It wasn’t quite as popular as others, but I still remember it as a kid at the local Mr. Gatti’s Pizza, and I also have fond memories playing it with my brothers when Capcom published the Buster Bros. Collection on PSOne. So I was excited to find out about a new game in the series. It’s available to download on most current game consoles, PC, and mobile devices, but reviewed on Switch here. Gameplay is pretty basic. You run around at the bottom of the screen and press the fire button to launch a harpoon in the air. When it hits the ceiling or a bubble, the harpoon will disappear and you can fire another. If a bubble hits any point of the harpoon (the tip or the chain), the bubble will pop and split into two smaller bubbles. Pop all the bubbles to clear the level. Bubbles bounce in different ways. Some go in an arc, while others bound around the screen like a billiard ball. The color of the bubble determines how it bounces. If you get hit by a bubble, an enemy, or run out of time, you’ll lose a life or have to start the level over, depending on what mode you’re playing. If you can pop several bubbles in a row without missing, you’ll earn a combo score. Sometimes you can pick up power-ups, too. These include extra harpoons so you can fire more than one at a time. Or a gun that lets you shoot rapid fire bullets at the bubbles or even a flamethrower. There are also shields that allow you to take an extra hit, hourglasses to stop time for a short while, and bonus foods that boost your score when collected. There are three modes of play in the game. The first is Tour Mode. This is most similar to the arcade. You’ll fly to different areas on a map to stop aliens from covering the Earth with bubbles. The neat thing about this mode is some levels are like puzzles, where you must use power-ups or enemies to help you pop bubbles faster in the short time limits you get. After every 15 levels, you’ll fight an alien boss. The only problem I had with this mode is that it’s really hard. If you get hit, you must start the level over from the beginning. I don’t remember if the arcade game was like that or if it let you use your next life right away. But at least in Tour Mode you can start at the last level you left off at, or replay any level you’ve already beaten to increase your score. 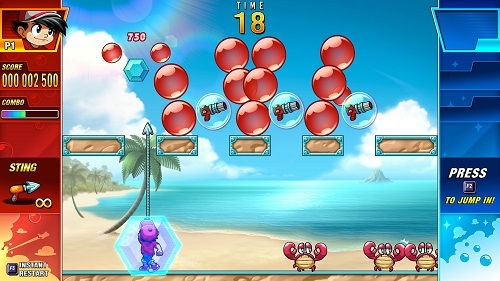 Another mode is Score Mode, where you have three lives to make it as far as you can. But it only unlocks after you beat Tour Mode, so I don’t think I’ll be doing that anytime soon. At least Panic Mode unlocks after only beating the first boss in Tour Mode. In Panic, you must pop an endless amount of bubbles, trying to get your score as high as possible. Make good use of the power-ups and exploding bubbles you get before you run out of lives! In all three modes, a second player can join in at any time, and it’s so much more fun with another person anyway. Really the only problem I had with this game is the high difficulty. Otherwise I really enjoyed this one. If you like classic arcade style games, you’ll want to check this one out. Pang Adventures is rated E for Everyone with ESRB descriptors of Mild Fantasy Violence and Mild Blood. If you get hit by a bubble or an enemy, you just say “Ouch” and fall off the screen, but that’s about as violent as it gets. But “Mild Blood?” Yeah there’s not really any blood in this game, but the ESRB classifies that category as any liquid that comes out of something living, whether it be bug guts or alien slime. And the boss aliens do ooze slime when you hit them. Reading skill is helpful for the menus, but not necessary just to play. Younger players may find the game too difficult, but at least a second person can join in to help. I certainly enjoyed playing the other Buster Bros. games with my little brothers, so I imagine kids will like playing this one with others as well.